always the easy path, but I know it is the right one." 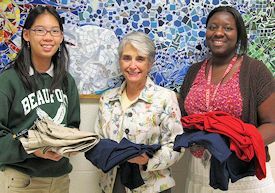 Donating School Uniforms - The three area Rotary Clubs raised $3,500 to fund a school uniform project to provide school uniforms to schools in Northern Beaufort County for the 2013-2014 school year. Rotarians picked up the ordered uniforms from Spectrum and delivered them to a school. (l-r) Natthaya Naruenartwongsakul, Beaufort Rotary Youth Exchange Student from Thailand, and Rotarian Harriett Hilton, to Jamie Allen, Assistant Principal at Broad River Elementary. In 2014 the club denonated $573 in cash and checks, 33 bags of food, and one bag of clothing Graham Holcombe, shown receiving the bags, coordinated the effort. 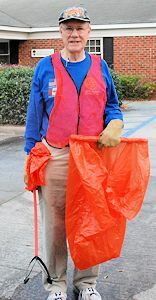 Our members pickup trash on a State highway in conjunction with Keep America Beautiful of Beaufort County on a quarterly basis. 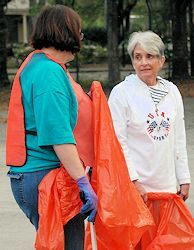 One recent Saturday morning, for example, 22 members picked up 330 pounds of trash. Members volunteered to assist HELP stock their donated items. Healing Heroes of the Lowcountry Fund. Member John Ballantyne presents a check to Beaufort City Councilwoman Donnie Beer, chairman of the Healing Heroes of the Lowcountry Fund, a non-profit organization whose goal is honor, empower and support our wounded military heroes, first responders and their families/caregivers, as needed, that may arise during hospitalization and/or recovery as well as to provide assistance for those with perpetuating requirements. John Ballantyne presents a check on behalf of the Club for $549 to the Wounded Warrior Project. In lieu of an honorarium to the guest speakers, the Club donates $15 to the Endowment Fund. Each year the Club presents an Employee of the Year Award as an important means of recognition for employees in the Beaufort community who contribute to civic and community efforts. The 2015 Employee of the Year was Joel Phillips, Supervisor, Beaufort County Airports, Lady's Island. This award is given to a law enforcement officer with the City of Beaufort, City of Port Royal Beaufort, County Sheriff's Department, the South Carolina Highway Patrol, or the SC Department of Natural Resources. The award was established in 1973 by retired Marine Colonel Jesse Altman who was the Beaufort Chief of Police for 18 years. The 2015 winner is Corporal Edgar "Kangeroo" Jansons of the Port Royal Police Department. (No picture available). In recognition of the special relationship that exists between the military and the city, the Rotary Club of Beaufort annually sponsors a "Military Persons of the Year" Award to honor members of the Armed Forces stationed in the Beaufort area for their outstanding contribution and involvement in military and local civic activities. Each honoree is nominated as most deserving by their respective commanders from among the many military personnel stationed at our nearby bases. The awardees are given an engraved plaque and a check to mark their achievement. The prestigious Rotary Bowl, established in 1936, is the highest Beaufort Rotary Club Award. The Rotary Bowl is periodically, but not every year, awarded to a member of our community who has exhibited significant civic responsibility over time. The recipient of this recognition has been deeply involved in the activities of our community and has made conscious efforts to help make life better for other people. This Bowl may be awarded to any person, Rotarian or not, whom the Rotary Bowl Committee deems most deserving. The recipient of the 2014 Rotary Bowl was Dean William Moss, Jr.
For over twenty-eight years Dean Moss has given dedicated and loyal service to the citizens of the City of Beaufort, the Counties of Beaufort and Jasper as well as the included municipalities, and the Armed Forces personnel serving within Beaufort’s four military installations. His worthy contributions are attributed in very large measure to his service as General Manager of the Beaufort Jasper Water and Sewer Authority. Dean’s leadership, direction and significant contributions to our community were recognized and honored with the George Walter Fuller Award for distinguished service in the water supply field, the Herman F. Wiederman Award for his service to our State and the prestigious Order of the Palmetto. Our club honors "the greatest generation" by supportimg this program which arranges for WWII vets to visit Washington D.C. On October 14, 2009 the first Honor Flight flew from Savannah to Washington, DC. Six veterans from South Carolina and Georgia made the trip. Since this first trip, through Oct 2012, 221 veterans have beeen taken to the WW II memorial Two trips per year are planned.The veterans do not pay anything. The program is entirely funded by the generosity of donors, including the Rotary Club of Beaufort and District 7770 matching gift. 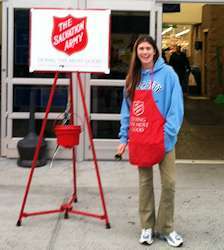 All the volunteers that accompany the veterans pay their own way. 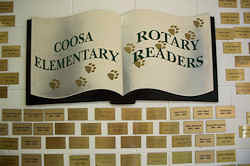 Rotary members volunteer to work with individual students at elementary schools to help them enhance their reading skills. Those who participate are also encouraged to provide mentoring to the students as well as general guidance. 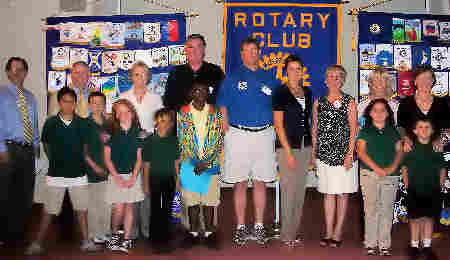 Rotarian Bob Cummins introduced the program in 1991 at Lady’s Island Elementary School following a program that had been initiated at the Rotary Club of Hilton Head. 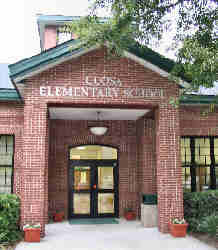 The program was moved to Coosa Elementary School in 1995 and Lady's Island Middle school was added in 2009. Currently 9 members are participating---working with about 10 children. The Club awards at least three scholarships each year to outstanding Beaufort students who will enter college in the fall or to recent winners who are attending college. 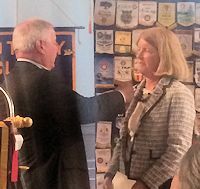 The award was established in memory of Lieutenant General George Forsythe who retired to Beaufort from the Army and became an active member of the community and president of this Rotary Club. The 2015 winners are: Brandy Bassinger (Beaufort HS), Ian Klauck (Battery Creek HS) and Ivan Estrada (Beaufort HS) Not pictured. Each year the club awards a scholarship to a student who has chosen to further his or her education via technical training in today's technology-based workforce. The scholarship of $1,000 will assist the student as he or she pursues an education at a post-secondary technical school, college or university. The 2015 winner was Kerri Long (Beaufort High School). Interact is a world-wide club for youth interested in service and helping others. It is is sponsored by Rotary.  Beaufort Academy Interact, sponsored by Beaufort Rotary, views its role as a mission team both inwardly and outwardly by performing community service projects independently and in conjunction with Rotary. visited Canal Apartments and shared Halloween and Thanksgiving celebrations with the residents. participated in the Highway Clean-up program. To find out more about the entire District Exchange Program click the Logo. Our 2014-15 inbound Youth Exchange student is Carolina Nogueira from Belo Horizonte, Brazil. She turned 16 at the end of September and is attending Beaufort Academy. She is the oldest of three girls in the family. Her father is a businessmand in the textile industry. The Club donated money for medical supplies and equipment to assist a local medical group, headed by Dr. Tony Bush, who travel on missions of mercy and medical aid to Haiti each year. 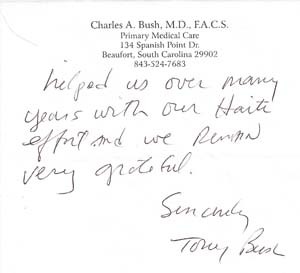 Here's a thank you note from Dr. Bush. Graham Holcombe (right) presents a check for $500 to Dr. Baxter McLendon (left). In the center is Dr. Cheong Jirawison an ophthalmologist from Chaing Mai, Thailand who is visiting Beaufort under this program. Members give their pocket money to fund a District approved project to support research that finds a cure for this devastating disease. 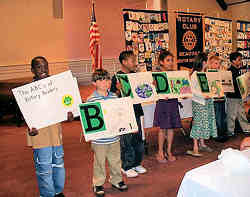 In Rotary year 2005-2006 the Club collected over $4,000 for the Fund. 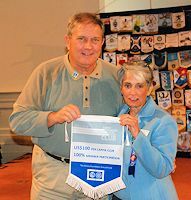 Every Rotarian, Every Year - ADG Bob Gross presents President Harriett with the EREY Club banner signifying every member of our club donated to The Rotary Foundation Annual Fund, averaging $100 each. Pictured from left to right: Fly Flanagan (3 PHF), Frank Gibson (6 PHF), Wyman Haigler (2 PHF), Linda Bailey (3 PHF), Woodie Rutter (6 PHF), and Harriett Hilton (7 PHF). 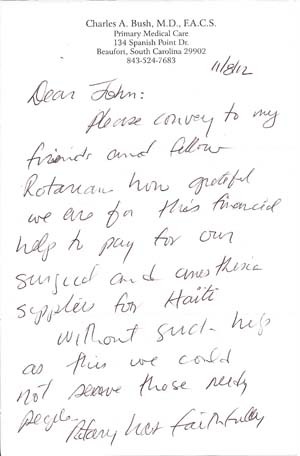 The Rotary Club of Beaufort is a 100% Rotary Foundation Sustaining Member Club. 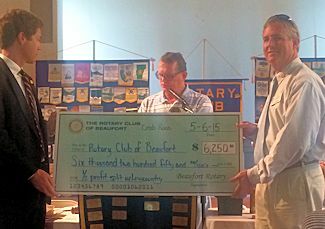 President Sam presents Allen Freeman, the Rotary Foundation Chair, with a symbolic check for $10,050, representing the personal contribution of $100 by every member of the club to the Annual Fund during the Rotary year. 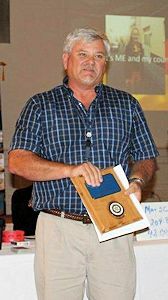 Our own Wayne (Gabby) Grabenbauer Sr. is the third Rotarian in District 7770 to become a member of the distinuished Arch C. Klumph Society. 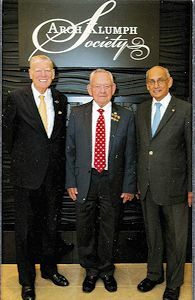 He was inducted into the Society at a special ceremony in the Rotary International World Headquarters at Evanston, Illinois, presided over by John Kenny, former R.I. Presdent and Chair of the Rotary Foundation Board of Trustees and Kaylan Banerjee, also a former R.I. President and a Rotary Foundation trustee. 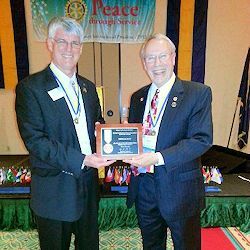 The following is a picture of Nick Hunt receiving the Rotary International Service Above Self Award from District Governor Ed Durea. This is an international competitive award granted to a maximum of 150 Rotarians each year. We are very proud to have Nick in our club!! Club fellowship is maintained and enhanced by social events held throughout the year: the Installation, a holiday party, an Oyster Roast, held jointly with the other two Rotary clubs in Beaufort, a Valentine luncheon, and the Spring Fling. In addition evening fellowship meetings are held in place of a luncheon meeting when there are five wednesdays in a month. 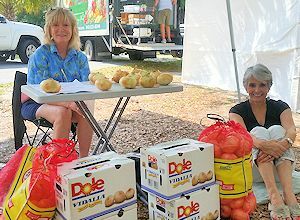 In the spring Beaufort Rotarians purchase or sell boxes of "Vidalia Onions" for themselves, family or friends. Each Club member is responsible for selling a minimum of 100 pounds of onions or paying $50 instead. 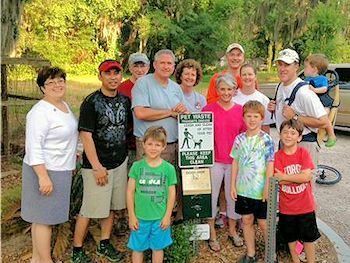 (A joint venture with the Rotary Club of the Lowcountry). A major fund raiser held in April as a part of the Old Village, Port Royal Softshell Crab Festival. The goal is to raise money for our charity projects. Approximately five-thousand (5,000) rubber crabs are made available for adoption. Crabs are adopted by contacting a member of the Beaufort Rotary Club and the Rotary Club of the Lowcountry or online.The participating clubs seek both individuals and businesses to adopt crab for a suggested donation of $10.00 per crab. Approximately five-thousand crabs race, regardless of the number adopted. The crabs are dropped into Battery Creek near the Sands Boat Landing in Port Royal. Winners are determined by the first adopted crab to cross the finish line. Chances of winning depend on the total number of qualified entries. The first crab race held in 2012 netted $2,300 which included paying off all the initial sunk costs necessary to initiate the fund raiser. In 2015 we netted $6,500. Each year, during July, the three clubs of Beaufort sponsor the Low Country Supper as a part of the Beaufort Water festival. 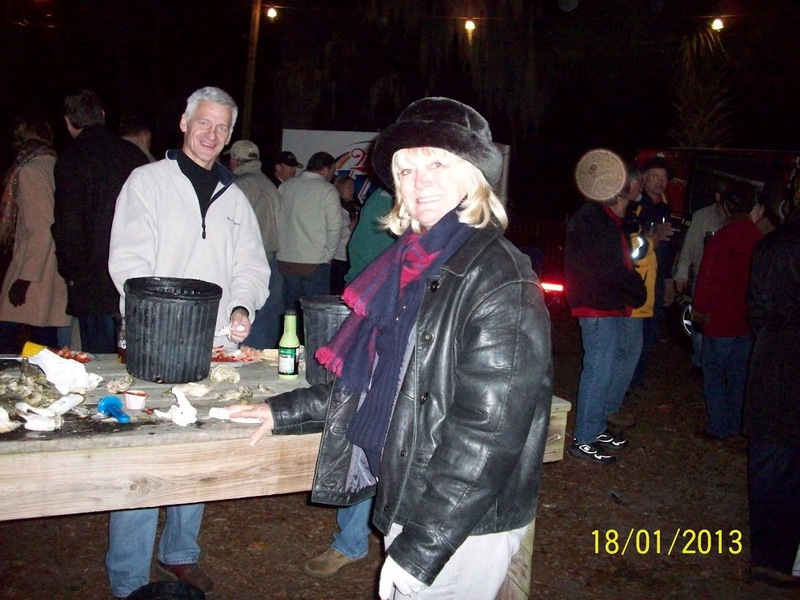 Forty-one of our members donned rotary aprons and served the meal, a traditional Frogmore Stew. The supper is one of the highlights of the Festival. We also participate with the other clubs in selling beer at the annual Water Festival.